Moving the Needle: Ruben Tejada takes home on a passed ball, +.180 WPA. 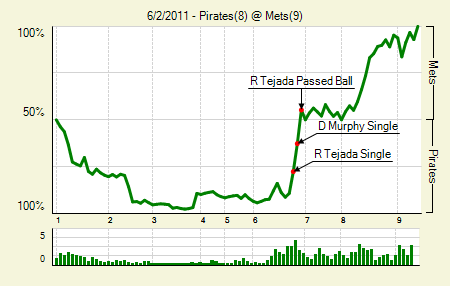 Remember two nights ago, when the Pirates got like six straight lucky breaks and took the lead against the Mets? Well, the baseball gods apparently felt bad about that whole ordeal and decided to turn the tables in yesterday’s game. The Pirates jumped out to a 3-0 lead in the first, and in the third they scored their seventh run. The Mets started the comeback in the bottom half when Carlos Beltran belted a three-run shot off the facing of the second deck in left-center. It was in the sixth when the Mets would get their breaks. They worked for the runs, no doubt, riding a double and two walks to a bases loaded, two outs situation. Two singles made it 7-6. Chris Resop came in to relieve Paul Maholm, and on the first pitch he kinda missed the target — though it was just to the other side of the plate. In any case, Dusty Brown missed it, and it hit off his glove, bouncing far enough away that Tejada scored easily, tying the game. Tejada would later hit the go-ahead sac fly. He drove in three in the game. Neil Walker: 2 for 5, 1 HR. After a hot start to his sophomore season he’s been pretty mediocre since. Even on his current seven-game hit streak he’s just 10 for 30 with a double and that homer. Moving the Needle: Josh Hamilton ties the game with a single, +.147 WPA. Cleveland jumped out to a 3-0 lead in the second, but the Rangers answered in the fifth with three of their own. The last run came when Hamilton smacked a 1-0 pitch up the middle. 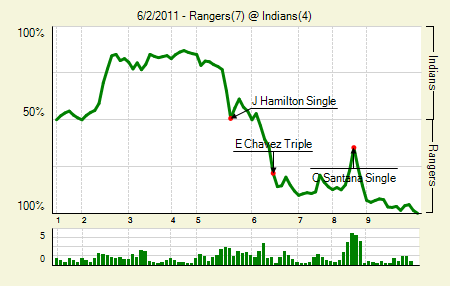 The rally would end there, but the Rangers picked it back up the next inning, scoring on a sac fly and passed ball. Nelson Cruz: 2 for 4, 2 2B. He’s hit in six straight, going 11 for 25 with four doubles and two homers. Mitch Moreland went 2 for 3 behind him, but actually never drove in Cruz. Yorvit Torealba, who went 0 for 3, drove in Cruz twice. Moving the Needle: Wilson Ramos doubles in a pair, +.158 WPA. The Nationals got their offense going early, scoring three runs in the first inning off Zach Duke. Ramos provided the bulk of the damage when he doubled off the wall in center with two outs, scoring both base runners and making it a 3-0 game. The game then got relatively quiet until the ninth; two runs scored, but they were both on outs. In their last at-bat the Nats tacked on a few runs, sealing the 6-1 win. Jordan Zimmerman: 7 IP, 6 H, 1 R, 1 BB, 4 K. That’s only the second time this season he has completed seven innings. It’s also the fewest number of runs he’s given up in a start. Despite that, he still has a 3.61 ERA, with a much shinier 2.72 FIP. 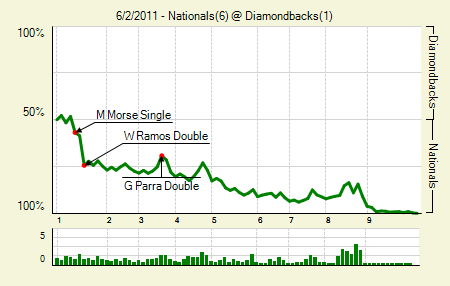 Mike Morse: 4 for 5. They were all singles, but even so a four-hit day is pretty big. He drove in two and scored two. Moving the Needle: Jeff Francoeur ties the game with a double in the fist, +.111 WPA. It’s always odd to see the biggest WPA swing happen when the losing team ties the game, rather than when the winning team takes the lead. 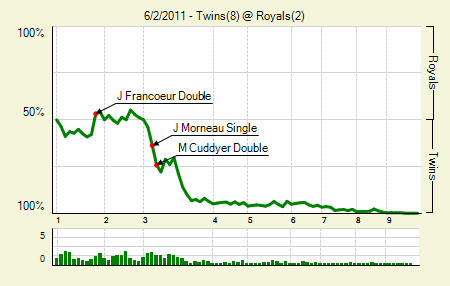 In any case, Francoeur’s double in the first tied the score at one, but that’s hardly the story. The story is that the Twins placed both Jim Thome and Jason Kubel on the DL before the game, yet broke out for eight runs against the Royals. Sean O’Sullivan can cure offensive woes, I guess. Michael Cuddyer drove in the go-ahead run with a double in the third, which also set up runners on second and third with none out. An error allowed a run to score, and then the Twins put together a string of singles that tacked on four more. Anthony Swarzak: 6 IP, 7 H, 2 R, 2 BB, 1 K. Really, it was Francoeur who killed him. The rest of the team he handled quite well. Ben Revere: 1 for 3, 1 2B, 1 BB. Gets called up, drives in and scores a run. Revere gets a pat on the back for that one. 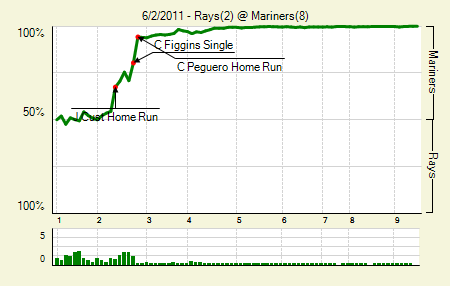 Moving the Needle: Carlos Peguero’s homer makes it a five-run lead for the M’s, +.138 WPA. The Mariners have put up a big number on a few occasions this year. Last night they got started early, ripping James Shields in the second inning. The assault included a leadoff homer, a reached-on-error, two singles, including an RBI one, and Peguero’s golf shot over the center field wall. That put the M’s up big, and with King Felix on the mound they were fine, just fine the rest of the way. Peguero homered later in the game, too. Adam Kennedy: 3 for 4, 1 2B. He’s having a surprisingly productive year. HIs .147 ISO is higher than any season of his career. Moving the Needle: Aubrey Huff gives the Giants life with a homer, +.172 WPA. It was not the greatest debut for Michael Lynn. He struck out five in 5.1 innings, which is nice. But he also allowed five runs, including Huff’s first homer, a two-run shot to center that cut the Cardinals’ lead to 3-2. Lynn got into further trouble in the sixth, when he allowed the Giants to pull ahead 4-3. Trever Miller cleaned up the mess, but in the next inning Maikel Cleto made his major league debut, and that went poorly, too. A pair of walks, a double, and two homers — including one by Huff — did him in. The Cardinals fought back, but Huff struck again in the ninth with a two-run shot to cap the victory. Andres Torres: 3 for 5, 1 2B. He scored three and drove in two. Freddy Sanchez: 1 for 5, 1 HR. He drove in four. Torres, Sanchez, and Huff actually drove in all of the Giants runs. Colby Rasmus: 2 for 5, 1 HR. His homer in the seventh cut the Giants lead to three. Moving the Needle: Carlos Lee slams a double, +.128 WPA. I think Carlos Lee thought he got all of that one. He gave a little pose after rapping a ball to left-center in the third inning, but it didn’t quite have the distance. Instead it bounced up over the fence. That probably saved the Padres a run, as Hunter Pence was flying around third. He would eventually score on a ground out. 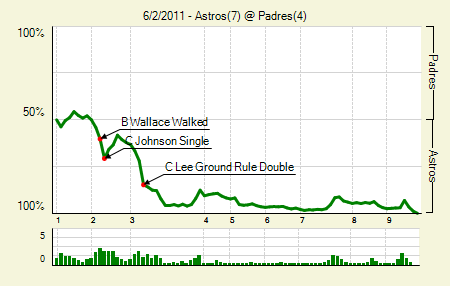 When the dust settled the Astros had put up a six spot in the third, which they rode the rest of the way to victory. Chris Johnson: 2 for 4, 1 HR, 1 BB. The walk was intentional. His homer came later in the game, after the Astros had their big lead. He did, however, drive in the game’s first run with a single in the second. Brett Wallace: 2 for 4, 1 2B, 1 BB. He also drove in a run. We hoped you liked reading The Morning After: Game Recaps for June 2nd by Joe Pawlikowski! You need to fix Jordan Zimmermann’s spelling and link.